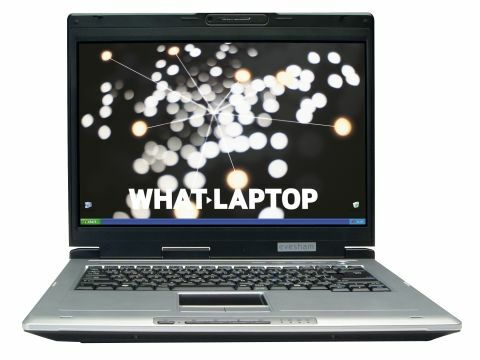 As one of the first UK laptops to use Intel's Centrino Duo mobile technology, it's surprising that the Voyager C550 from Evesham is so bulky. Measuring 355 x 275 x 42mm and weighing 3.2kg, some rivals are more convenient options for travel use. However, neither contains the same powerful components of the Voyager C550. Built around an Intel Core Duo T2400 processor, the dual-core CPU of the Voyager C550 runs at 1.83GHz for high-powered performance. Paired with 1024MB of DDR2 SDRAM, this makes the Evesham very highly specified for a portable laptop. A 100GB Hitachi hard drive matches the ample storage provided by the top competition. However, its 7200rpm rotational speed boosts performance further; ensuring fast operation when writing and accessing data. While this score reflects the advances of Intel's dual-core technology, the battery life of the Evesham was less convincing. Running on battery power for 134 minutes, the Evesham will only suffice for short journeys. While laptop manufacturers find the optimum configuration for exploiting the full potential of dual-core CPUs, current performance is yet to match promised potential. However, the Evesham's real strength lies in raw desktop performance, bolstered by its multimedia ability. Avoiding the use of Intel's integrated 945GM graphics chip, the Evesham opts instead for an ATi Mobility Radeon X1600. The top-end GPU of ATi's PCI Express range, a score of 6460 points from 3DMark 2003 tests shows strong ability for mid-level gaming. Although our review unit was not equipped with a Super-TFT screen, the retail model will include an X-Bright panel. Where the Evesham falters somewhat is in its design. Despite strong usability, the chassis feels lightweight and lacks style. While others avoid the use of an internal optical drive to maintain mobility, the Evesham incorporates a built-in dual format DVD drive. Supporting the creation of dual layer discs, the use of high capacity external storage is made easy. For configuring high-speed networks locally and abroad, 802.11a/b/g Wi-Fi and Gigabit Ethernet both come as standard. Integrated Bluetooth adds further wireless compatibility. Although yet to push dual-core technology to its peak ability, the Evesham Voyager C550 makes a convincing argument for future potential. With strong desktop performance from a slim - if not highly mobile - chassis, the Evesham is certainly a step in the right direction.